It is sad to say but there is more than one Chihuahua rescue in existence. This is because so many irresponsible owners purchase Chis for all the wrong reasons, and then give them up or abandon them because they don’t want to commit to the dog. Chis are also given to shelters after nipping small children once people discover that they are not compatible with kids. It is unfortunate that Rescues need to exist in order to save many of the unwanted dogs in this world, because no dog should be unwanted. However, it is fortunate that there are people out there who care enough about dog breeds, such as the Chihuahua, that they will go out of their way to rescue and care for an abandoned dog. 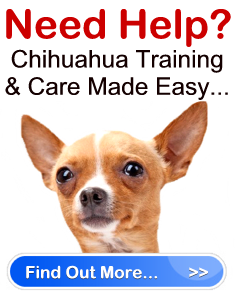 If you would like to show your support to any of the Chihuahua rescue shelters in your area, or anywhere in the world for that matter, you can do so by making donations to the rescues. Donate money – This is the most popular method of donation. Rescues can always use the support of money to help them care for the dogs and cover expenses such as food, Vet bills, etc. In addition, another bonus when you donate money, if the Chihuahua rescue is a recognized charity, your money donation will be tax deductible. Donate Food – If you have a dog or not, you can always purchase dog food and give it to the rescue. Contact them first and ask what brand they would prefer and get the biggest bag you are willing to give. Donate treats – Every dog loves treats. Giving a few boxes to the Chihuahua rescue will mean a lot to both the volunteers and their dogs. Donate old dog items – Any extra dog items such as food dishes, leashes, collars, toys, beds, etc. If you don’t have a dog, you can also consider buying any of these items. Donate blankets and comforters – Every dog loves their very own special blanky they can cuddle into. Donate any items you may have that could help the charity – There is more than just dog items a rescue may need. Some rescues may need a printer, printer supplies (ex. Paper, ink, etc. ), cleaning supplies, etc. Donate your time – If you want to get involved, find out if the Chihuahua rescue can benefit from your help. Getting involved with a Chihuahua rescue is a great feeling. The donations you make will help show the Rescue your support, and will help to make the lives of the Chis happier.